The Greek Drachma is valued for its historical provenance as much as for its gold content. Drachmas are part of the coinage that gave birth to all modern currencies and the original coin stemmed from the monetary system of Ancient Greece that was developed from 800BC. 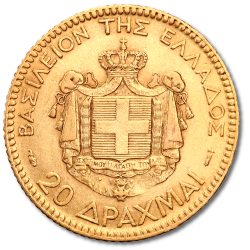 Although Drachmas were used as far back as the 9th century, modern Drachma Gold Coins date from the mid-19th century. These beautiful coins are struck from the .900 gold that was standard across Europe at the time. They're a great way to add precious metal to your portfolio but many buyers choose Gold Drachmas for their historical value and romantic connotations. We stock a range of Greek Gold Drachmas from mixed years at coininvest.com.